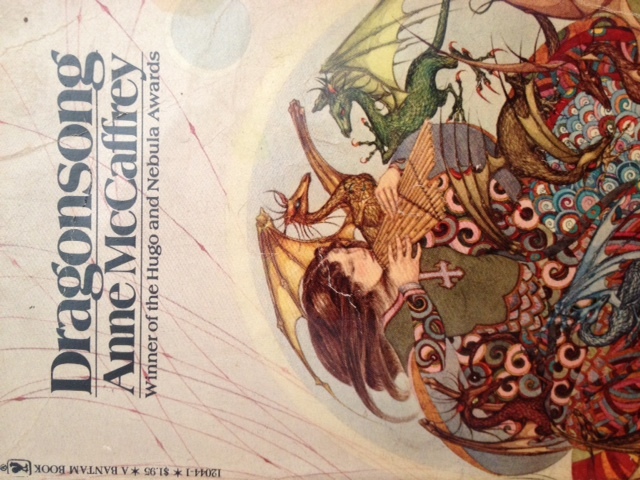 Anne McCaffrey died yesterday, and though I haven’t read a book of hers in years, I remember thinking about her just the other week, thinking how amazing it was that she was still going, thinking how without her, my whole teenage years might have been very different. The very first SF-Fantasy-ish book I remember reading was Madeleine L’Engle’s “A Wrinkle In Time,” followed by Susan Cooper’s The Dark Is Rising series. But both those books were given to me by adults, my father’s cousin and my mother, respectively. And they were both set in our world. I chose it myself. I still have that book, with its $1.95 cover price. It was a story on another world, with a young heroine and these magical creatures called “fire lizards” who became her faithful companions. It was a pretty classical YA book with the Cinderella themes McCaffrey loved: young woman in oppressive surroundings, terrible trauma, escape and redemption through her own strength of will. I devoured it, and the sequel, and moved on to “Dragonflight” and “Dragonquest.” “The White Dragon” came out soon after that, melding her more mature series with the YA themes I’d loved in “Dragonsong” and its sequel, and I thought it was the most amazing book. She didn’t shy away from adult situations (in the Dragonflight-quest-White Dragon series; the Harper Hall books remained a YA-proper PG). She made characters with flaws, and terrible things happened to them sometimes. Her characters changed; they became old and bitter, or they suffered from past mistakes. They also found redemption and love, satisfaction and triumph. And she loved animals. The dragons were wonderful characters in their own right: just human enough and just alien enough to be fascinating, to give that sense of closeness with the “other.” Not hard to see now why that would appeal to me, but her stories were the first to show me how that appeal could be given voice. My closest friend all through high school shared these books with me. We cast the “Dragonflight” movie with other friends over and over again. We traded McCaffrey’s other works, and other science fiction books. I discovered Norton, Eddings, Niven, Asimov, Brust, Anthony; some have stayed with me and some have not, but that was how I spent seventh grade through the end of high school: reading. I wrote to her as part of a high school project to tell a favorite author what you liked about their books, and got a postcard back. She promised me that I would be on the list to get a fire lizard (I’m still waiting). I got other friends into the books; one of them tried to do an English paper that was supposed to be on a “Classic” book on the strength that “Dragonquest” was labeled a “SF Classic” by Del Rey. In college, I fell away from McCaffrey somewhat. “Moreta” and then “Nerilka’s Story” proved a litle disappointing. I found other authors I liked better: Julian May, Susan Cooper, Stephen Donaldson (only the first series). I discovered Stephen King and Robert Heinlein. But when Anne McCaffrey came to BaltiCon, I jumped at the chance to go meet her. Nothing much happened; she signed a book for me (“The Mark of Merlin,” a very non-SF book with a German Shepherd dog featured prominently; it was and is rare and I was proud to have tracked it down–this was before the Internet, too), thanked me for reading, and that was that. But she was energetic, enthusiastic, and so, so nice: an exemplar of what an author should be in public. I haven’t read her books in years and years, but I still keep them with me. I remember them fondly as the first time I was immersed in another world, one of the first books that I hated finishing because it meant I had to leave the world. It’s her books I think of whenever someone tells me I inspired that feeling in them, and I feel awed and humbled even to have that little connection. From the eleven-year-old me in fifth grade, from the high school junior and the college student, from the reader and writer I am today: So long, Anne, and thanks for all the dragons. I know that everyone wants a magic bullet. They want me to say, “Oh, I learned this ancient Navajo trick of focusing my mind on writing that allows me to be amazingly productive. I learned it from Stephen King’s book “On Writing.” It’s at the beginning of Chapter 3. Just recite those lines whenever you want to write and your mind will be clear and the words will come.” Or something. The answer is simple, but it’s not easy. You have to get into the practice of writing. It’s as simple as that. Develop it as a habit. Your body and mind form habits easily. The more you do something, the more you will expect to be doing it. But at the beginning, you have to force yourself in order to acquire the habit. So I’ll tell you what every other writer will tell you: make time to write. Okay, you’re nodding, but you’re not listening. Make Time To Write. You know best how you can accomplish this. If writing is important to you, you will figure out how to squeeze time out of your day. Maybe you’ll set aside an hour a day, or an hour and a half a day. Maybe you’d rather do a four hour block once a week. Maybe you can work it out twice a week. However you work it, make sure that you can observe that time, come what may. Because if you skip it just once, it’ll become easier to skip it next time, and before you know it, you’re saying, “what’s the point, I’m not getting anything done,” and you look up at the calendar and it’s been six months since you wrote. Once you get into the habit of writing, you can become more loose with your schedule–you can fit your writing into your day, rather than fitting your day around your writing. But to start with, to get writing ingrained into your routine, be rigid with it. You will hear this same advice over and over and over again. The other part of it is: if writing is important to you, you will make time to do it. The converse, the part that people don’t want to hear, is that if you aren’t making time to do it, then it isn’t important to you. “But,” they say, “it is important, it’s just that I have all this other stuff/I can’t think of anything to write.” Look, it’s okay. You make your decisions based on what’s important to you, not what should be or what you want to be. If writing is important to you, you’ll do it. If it’s making you terribly unhappy not to be writing, look at the things you can give up to make time for writing. Would giving any of them up make you more unhappy? Is there just one you could give up? As I mentioned, I was on a panel this weekend about Keeping Your Motivation and Inspiration. For writers, that is. A bunch of ideas came out of it, so I thought I’d list those and just let you guys chime in in the comments. * If you’re not writing because you feel like the writing is being forced, don’t worry about it–force it out. The important thing is to get it down. * Stuck on one project? Write something else, even if it’s a silly little thing that you don’t think will be worth your time. * Break up your immense novel project into manageable chunks. Set small deadlines and meet them. * Do research (warning: use sparingly; you can waste years doing research and not writing). * Read something by a writer you admire. Picture what of their work you can copy. * Read something by a writer you despise (or just go online and find some bad fiction). Picture how you would do the story better. * Read something bad by a writer you admire. Picture how they would have done it better. * Read something you wrote five years ago. Resist the urge to cringe. Think about how you would do it better now. * Go to a panel on Keeping Your Inspiration and Motivation. Ha ha. No, seriously–go to a convention or workshop or other gathering. Meeting and talking to other writers is a great way to get motivated.